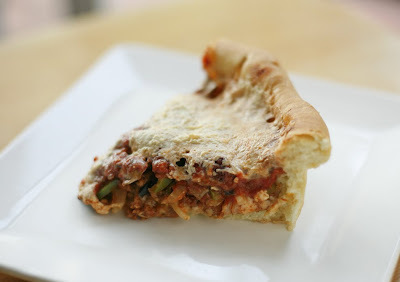 Last week I was scrolling across Quarry Girl's blog and I came across her deep dish pizza post. 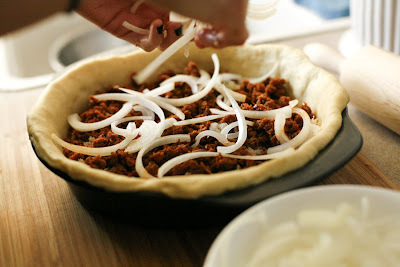 I looked up how to make them and noticed that it isn't that different from making a regular pizza. 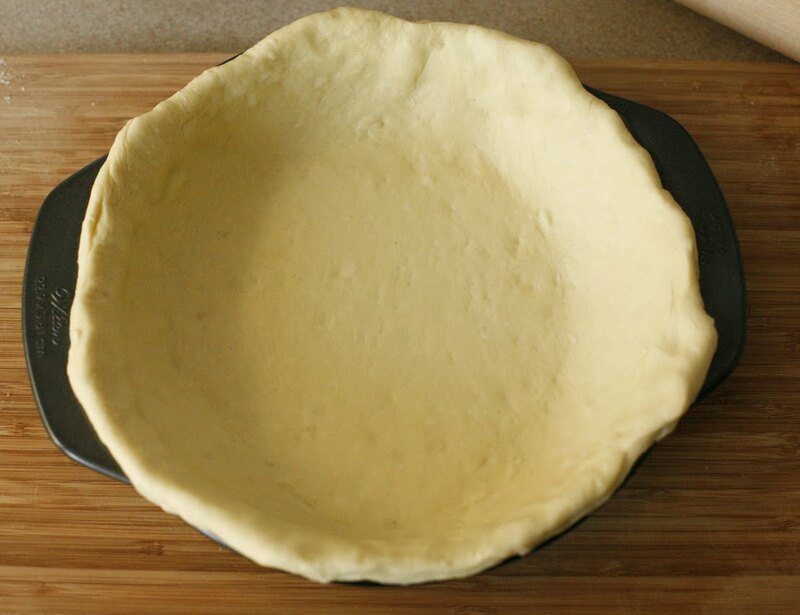 Only a couple changes needed, such as adding semolina flour to your pizza dough and obviously changing your pan to a deep dish pizza pan. I don't know how many of you own deep dish pans but I sadly do not. I substituted it with my 9 inch cake pan and the result came out fine. 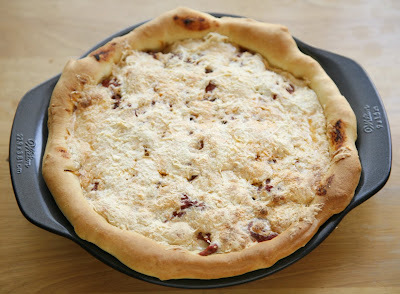 This recipe took me an hour and a half to make, which really isn't that bad, considering that the dough and sauce are all made from scratch. Feel free to change around the toppings to any veggies of your choice. 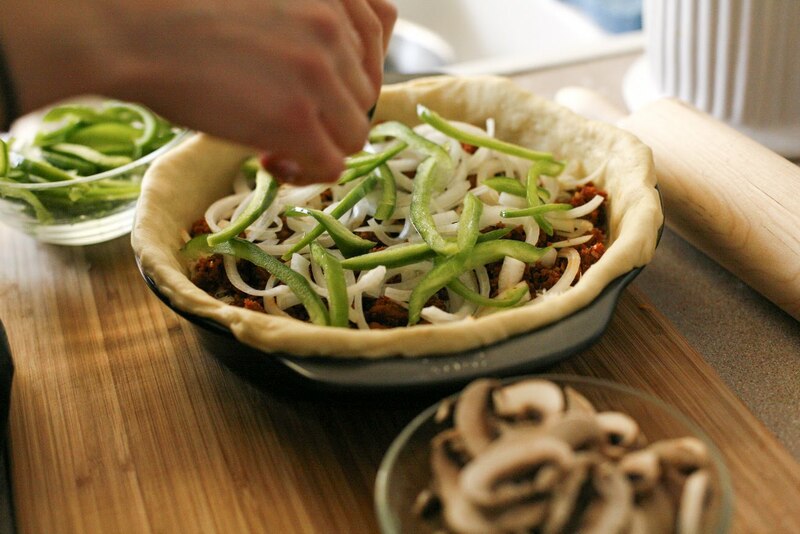 Now go ahead and impress your friends with your very own Chicago style pizza! 1. 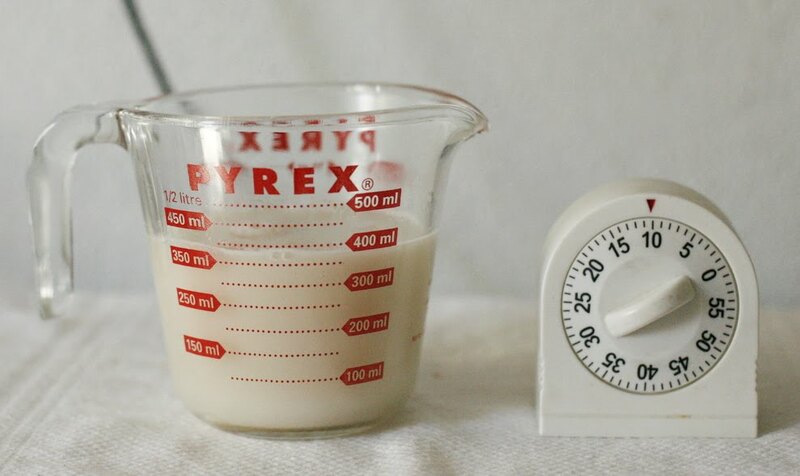 In a small bowl, combine water, yeast and sugar and stir to combine. Let sit for about 10 minutes or until the mixture is foamy. 2. 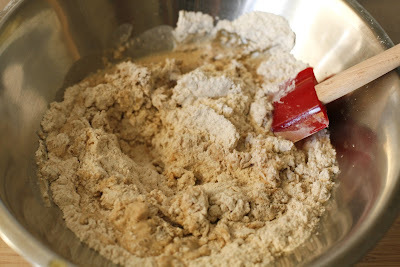 In a large bowl, combine the all-purpose flour, semolina flour, oil, salt and yeast mixture. Stir well to combine. 3. Transfer to a lightly floured surface and knead for about 5 to 10 minutes, until a smooth dough has formed. Place in a lightly oiled bowl and turn to cover the entire dough with oil. 4. Cover with a damp towel and allow to rise in a warm area until double in size, about 45 minutes. 5. In a medium sized sauce pan, heat olive oil over medium high heat. Add the onion, celery and garlic and saute until soft and the onions are transparent. 6. Add tomato sauce and tomato paste and stir until smooth. 7. Add the remaining ingredients and bring to a slow simmer. Simmer for 30-60 minutes. Remove bay leaf. 8. 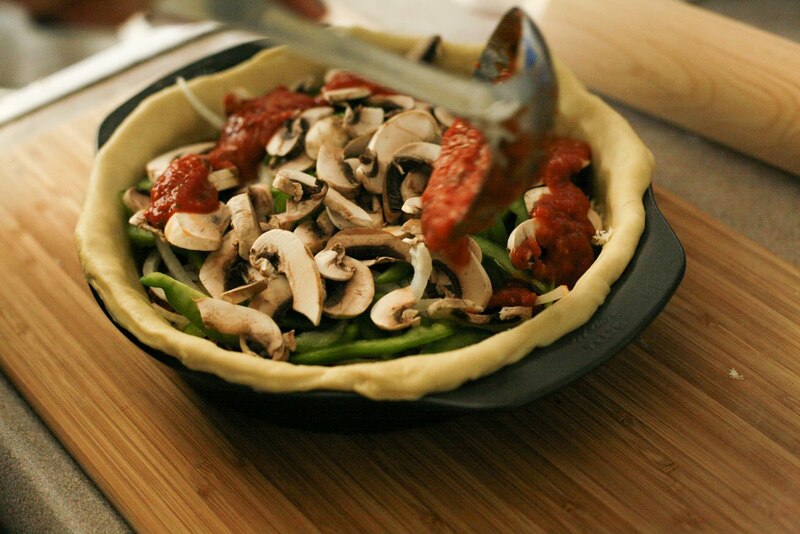 Oil a 12 inch round deep-dish pizza pan with extra virgin olive oil. 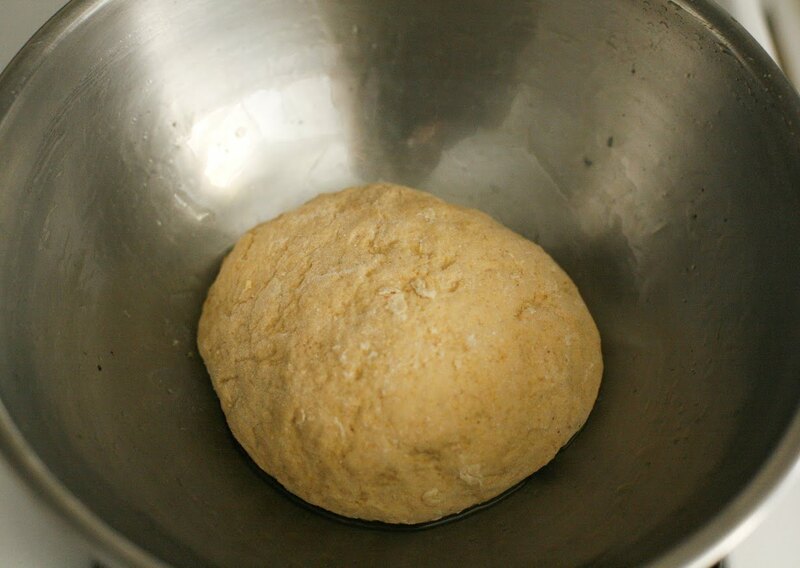 Place the dough in the pan, pressing to the edge and stretching about 1 1/2 inches up the sides. Let rest for 5 minutes. 9. 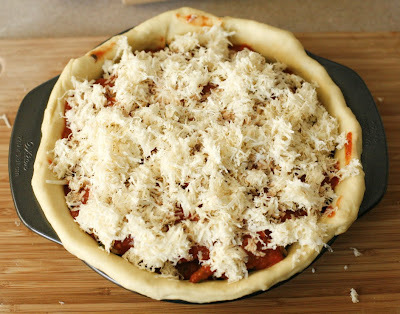 Layer half of the mozzarella all over the bottom of the pie. Ladle the sauce evenly over everything. Sprinkle the rest of the mozzarella evenly over the top of the pie. 10. 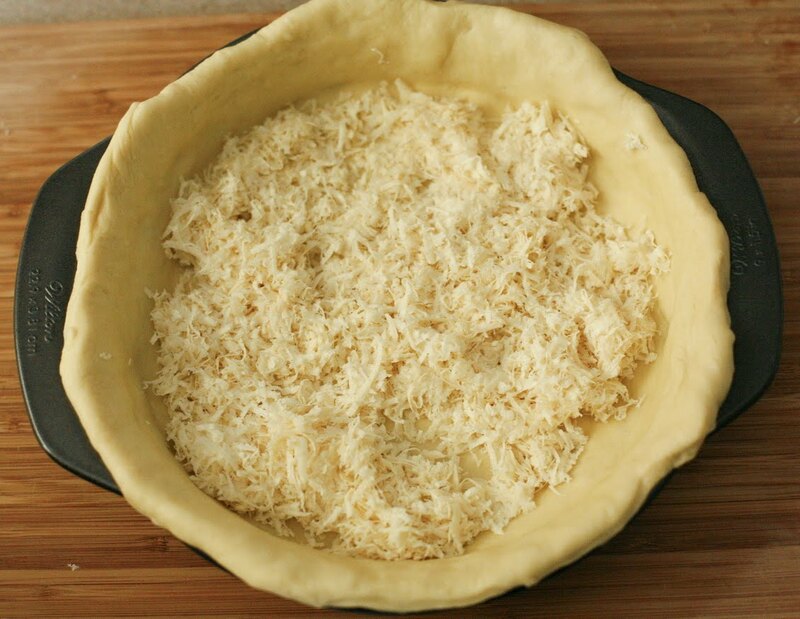 Bake until the top is golden, cheese is bubbly and the crust is golden brown, about 25 minutes. Remove from oven, slice and serve hot. On a side note, here a recent shot of my boy..nothing like a good rub down to start off your day! This looks and sounds amazing! I will have to try this for sure! looks yummy. i made a deep dish in my cast iron and that worked out well too! Yummo, we don't get pizza like that here but it totally looks worth the effort of making one at home! Looks like your cake pan worked perfectly. This just screams "super yum!" I've been wanting to try semolina in pizza crust for a while. I know I didn't win the Grammy but after having this vegan deepdish pizza; I soooo feel like a WINNER!!!! LOVE your blog! can't wait to try some of your recipes! p.s. Sorry for being away for so long. I went to Key West and didn't go near a computer the whole time. It was awesome...! I'm assuming that as a person alive on Earth you've seen an episode of The Simpsons. You know when Homer wants to eat something and he tilts his head back and starts drooling and groaning? Yeah. I need a deep dish pan. Now. I'm singing these praises right now. This is glorious. yummy! i think i'll try to make one someday soon too. 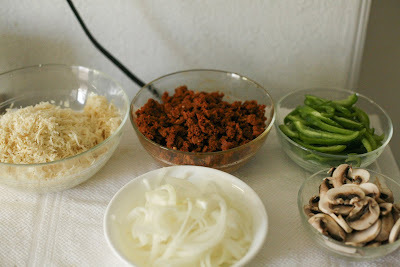 i like the one comment suggesting castiron skillet, great idea! that looks so good! 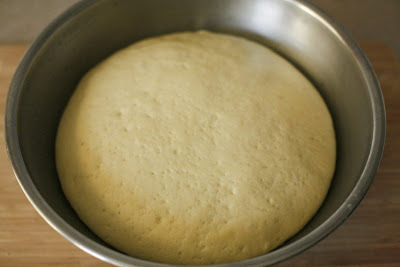 i don't have a deep dish or cast iron pan, so i'm glad to hear that a cake pan will work. Oh, it's been too long since I've stopped by! Look at all the amazing dishes! This pizza looks fantastic. 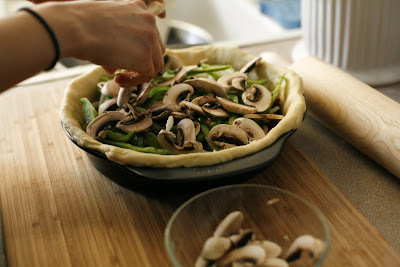 I made a veggie pizza that I'm going to post in a little while, but it's certainly not as wonderful as yours, I think. 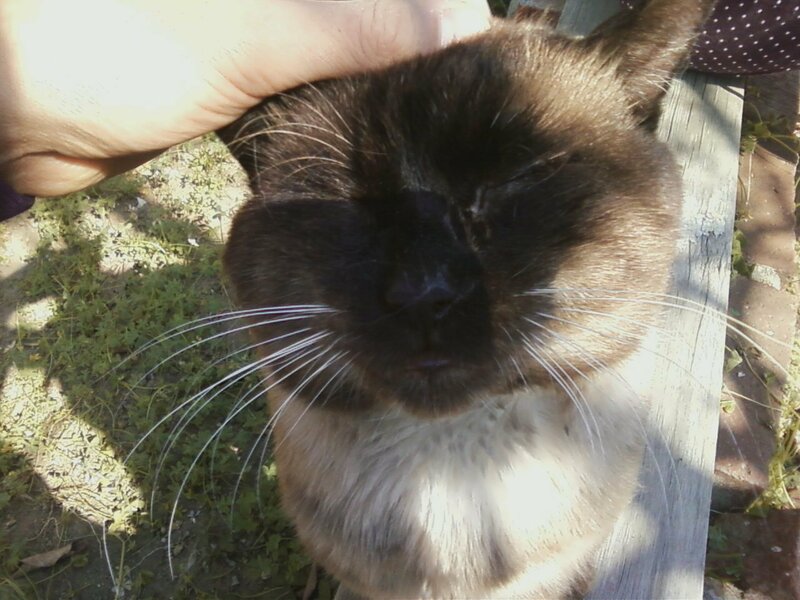 What a beautiful kitty! I love his coloring. One comment....real deep dish has the sauce on the top. The cheese is hidden until you cut into it!